Following disposal of the old Pendre police station in July 1894, tenders were sought on 11th September 1894 for erecting a new police station on this site. It was built by J. Williams & Sons, Felingynllo, at a cost of £1000. 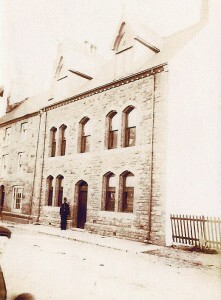 The new Police Station opened on 1st September 1895. Denis Williams was the first Officer-in-charge. Sergeant Evans was based here that year. In 1895 blue helmets replaced the old top hat uniforms. In 1901 the following persons lived here: Denis Williams, 56, Police Sergeant (b. Bettws Evan); Anne Williams, 58, his wife (b. Llandyfriog); Daniel O. Williams, 24, their son, college student (b. Aberaeron); Anne Picton, 35, married daughter (b. Llandyssyl); Denis John Samuel, 7, grandson (b. Pendre); and John Charman, 28, boarder, police constable (b. Llanfihangel-y-Creuddyn). In 1901 Denis Williams was the Assistant Relieving Officer for Vagrants for the Cardigan Union. In October 1905 Inspector Denis Williams retired as head of the Police Station. In 1911 the following persons lived here: David Davies, 55, Police Sergeant; Hannah Davies, 55, his wife; and Daniel Horton Davies, 17, their son, grocery assistant. In 1914 David Williams was the senior officer and John Evans was a police sergeant. 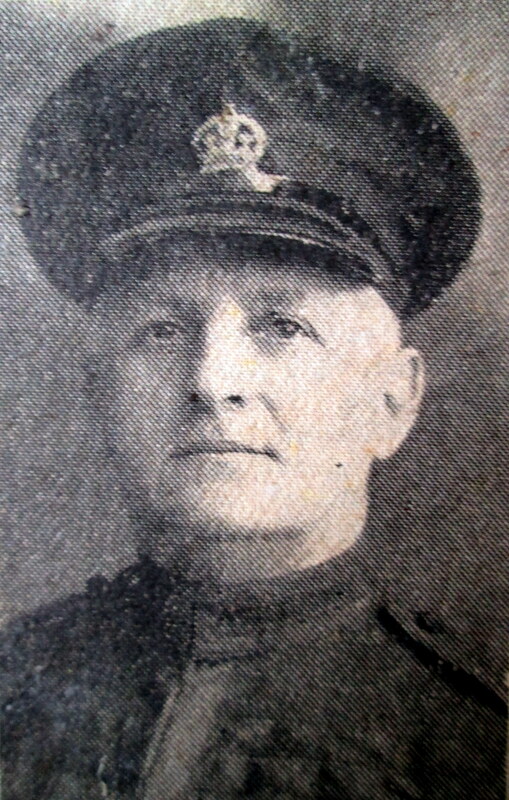 In 1914-20 David Williams was the senior officer. In 1918 John and Elizabeth Evans lived here. In 1923 David Evans became the Inspector. In 1923-34 Inspector & Mrs. David Evans lived here. On 8th July 1932 there were calls for a court house to be built in the town, the police station being inadequate for that use. In October 1934 Inspector David Evans retired and was succeeded by Inspector Jenkin Richards. Inspector Jenkin & Margaret Richards lived here in 1935-41. Cardigan’s first police car arrived in 1939. On 15th February 1941 Inspector Jenkin Richards retired. In February 1941 Inspector E. O. Williams became the officer in charge. Mrs. Williams lived here in 1949. On 5th March 1954 a runaway pig was “arrested” and held “in custody” overnight by Cardigan police. In 1955 Arthur Islwyn Williams and Mary Emma Williams lived here. In 1995 Superintendent A. Evans was in charge of the station. An open day was held here in September 1995 to celebrate the centenary of the station. In October 1995 Dai Thomas became the new Inspector in charge. 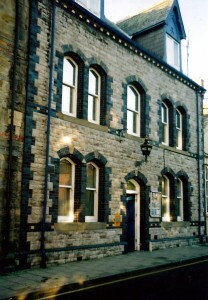 In June 1997 the Police station re-opened following a major refit. In 1998 or 1999 Inspector Dai Thomas left. In October 2001 Inspector Gary Evans left and Inspector Alfor Evans took charge of the station. In May 2005 Inspector Ian Thomas, 40, took charge of the station. 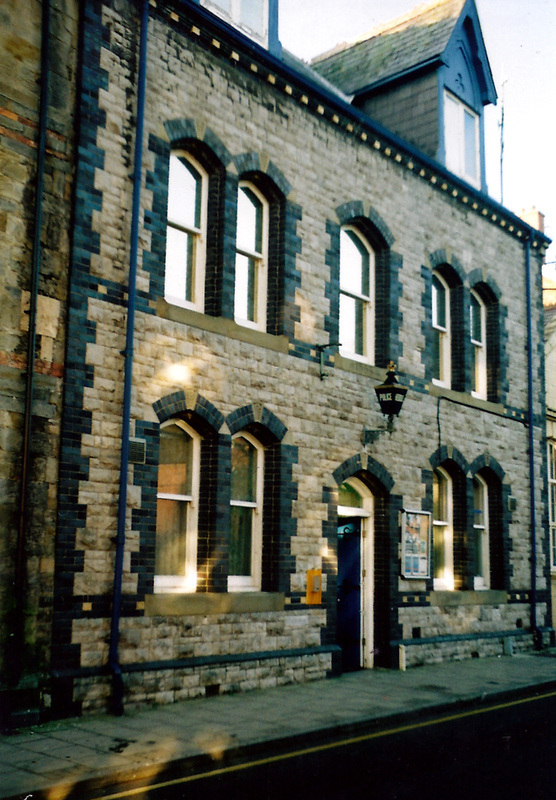 In October 2008 it was confirmed that the station was about to be closed, with the police moving to a new building at Parc Teifi and an office in the Guidhall. It closed in June 2010 and the building was left vacant. In April 2013 it was sold to a consortium of local people and was redecorated later in the year. 1895 dated police station, 2 storeys and attic, 5-window range in coursed rock-faced stone with grey brick dressings and pitched slate roof. Grey brick quoins to angles and similar dressings to openings. Plinth and first floor sill band. Ground floor has paired pointed-arched headed windows divided by grey brick pillars to outer bays, with keystones. Plate glass sashes throughout. Centre door has lower head, arched overlight and boarded timber door. Traditional 4-sided ‘blue lamp’ above with ‘Police’ in white lettering on blue glass. Finial to head and decorative bracket beneath. ‘1895’ date carved over door on sill band. First floor has similar windows to outer bays and wider single window to centre in matching style. Attic has to tall dormer lights, vertically bisected, with trefoil motif on timber boarding above. Light Gothic bargeboard and fluer-de-lys finials to apex of pitched slate roofs with crested terracotta ridge tiles. Slate-hung sides. Cast iron rainwater goods. Letter & Programme – Cardigan Police Station Open Day 03/09/1995. I am currently researching a WW1 soldier Cpl J.H.Morgans from our area. I came across a reference to a Cpl.Daniel Horton-Davies. They were both P.o.W.’s at a prison camp called Altdamm in what is now Poland. Do you have or know anyone who would have any information about this particular person, and his time in captivity. Thank to your site we do know that Daniel’s father was the Police Sgt at Cardigan station at around that time, hence my contacting your site. Daniel Horton Davies lived at the ‘Eagle Inn’ on Castle Street, Cardigan. There are some interesting snippets on him on the ‘People’s Collection Wales’ website. Sorry to bother you but could you tell me when The Elms (more recently known as Cupid) 31 Priory Street Cardigan was built as we need to know for insurance cover purposes.